The Swiss Government have introduced a new retailer registration scheme as of 1st January 2019. This ruling will affect non-resident companies who ship to Switzerland. These changes have come into effect in order to place foreign mail-order companies on an equal footing with companies domiciled in Switzerland. If a domestic or foreign mail order company generates a minimum of CHF 100,000 turnover per year from small consignments then its deliveries will be considered domestic supplies. Small consignments are defined as items that have a value of 65 CHF or below (circa £51.85 at the current CHF to GBP exchange rate). 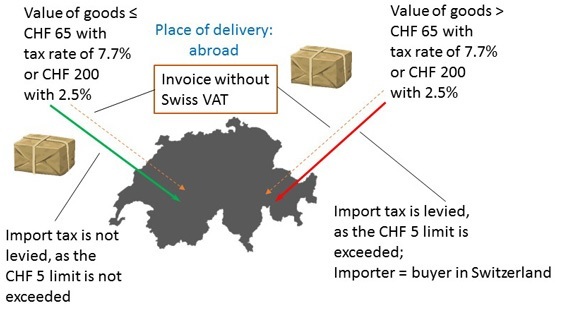 Companies that meet these conditions will be subject to VAT charges as such sales are considered taxable in Switzerland. If this information applies to your company then you must register for Swiss VAT so that such sales can be entered into the Swiss VAT register. Suppliers and partners of OCS Worldwide should note that there will still be no import tax on small consignments despite these new mail order regulations. Information on the mail-order regulations as of 1 January 2019. Source: Swiss Federal Tax Administration.